The iconic story of Oedipus comes alive in Robert Wilson’s series of breathtaking, distinctive tableau vivant. The celebrated director follows Oedipus’ story chronologically, without faithfully adapting Sophocles’ Oedipus Rex, from the moment of Oedipus’ birth and his abandonment as an infant to the moment of his self-inflicted blinding, following the horrific revelations: from the first light of birth to the last light he sees before it all goes black. Two ‘witnesses,’ a man and a woman, spin his tale, the life and times of Oedipus, speaking across the centuries. A bold, original concept by the National Theatre of Greece: Oresteia, the only extant ancient drama trilogy is presented in Epidaurus in a single performance by three directors in their Epidaurus debut, featuring a single cast and crew: Agamemnon by Io Voulgaraki, The Libation Bearers by Lilly Meleme, and The Eumenides by Georgia Mavragani. In the first part of Aeschylus’ trilogy, King Agamemnon returns to Argos, shortly after the end of the Trojan War. Agamemnon triumphantly marches into the city and his palace, flaunting the Trojan princess and Apollo priestess Cassandra as his captive. Clytemnestra welcomes her husband, all pomp and circumstance. However, it is quickly revealed that her enthusiasm conceals a well-orchestrated plan. She has decided to take revenge for the murder of their daughter, Iphigenia, sacrificed by Agamemnon to get the Greek ships sailing about ten years ago. The red carpet Clytemnestra rolls out for Agamemnon’s return foreshadows the impending bloodbath, as she and her accomplice/lover, Aegisthus, plot to murder the king and his concubine. Agamemnon, the first part of the Oresteia trilogy, marks the beginning of Aeschylus’ multifaceted theatrical project, built around the myth of the Trojan War, making a deep impact at the time it was written (5th - century Athens) and leaving its mark to every single era it has been ever since. Ten years after the end of the most terrible of wars, the Trojan War, the king returns home, only to be murdered by his wife. Ten years of anticipation for such a heinous crime. Within this poetic universe, where man remains an inscrutable enigma and the heavens bear witness to human actions, the victim and the victimizer swap parts. A ruling class silently watches this power play; a class that is ultimately divested of its power and its very being. Who is given the right to commit a crime and who grants this right to begin with? The performance will establish a dialogue with the two other parts (The Libation Bearers and The Eumenides), in what is an original collaboration, a joint exploration of a dramatist who ‘invented’ the theatre, at least Western theatre as we know it. In the second part of Aeschylus’ trilogy, Electra take centre stage, mourning her murdered father and obsessively anticipating the return of her brother, Orestes, her beacon of hope, with whom she plans to take revenge for Agamemnon. In the beginning of the play, Electra mourns over her father’s grave. The Libation Bearers, the women of the Chorus accompanying her, add to her laments. There, Electra is reunited with her brother, who returns after many years abroad, together with his loyal friend, Pylades, both disguised as outsiders. Upon seeing her in mourning, Orestes realizes they will be allies and reveals himself to her. Things escalate very quickly: aided by Electra, Orestes and Pylades pretend to be foreigners bringing the dead Orestes’ ashes home to Clytemnestra. After Clytemnestra welcomes Orestes, he reveals his identity to her and subsequently murders both her and her lover and accomplice, Aegisthus. The Furies arrive, relentlessly pursuing Orestes until the moment he will be acquitted at Areopagus. The second part of Oresteia is set ten years after the finale of Agamemnon and constitutes the bloody, beating heart of the trilogy. The ground has been laid for the arrival of Orestes, the young avenger who is under obligation to obey the ancient laws and retaliate: blood for blood. The dead father exacts revenge on his murderers. Agamemnon’s presence in this play is as palpable, albeit in a different way, as it was in Agamemnon. The landscape in The Libation Bearers is bleak and menacing. A new state has emerged, plagued by violence, terrorism, and a frightful silence, ruled by the illicit couple of usurpers, those who deceitfully stole the power from the rightful king, stained their hands with blood and plunged the country into darkness and chaos. The old world has reached a deadlock and is morally, socially, and politically bankrupt. Orestes’ appalling act is enforced by the gods and the universe itself. Violence breeds violence and the Furies lie in wait. The bright light of the burgeoning Justice that is set to reconcile the old world with the rising new world still has a long way to go – and it will be a long and arduous road. There is no other option left. The repetition of a crime turns into a cleansing ritual for an entire society transitioning from darkness to light. The third part of the trilogy revolves around Orestes’ pursuit by the Furies and the holy trial he must submit himself to in order to be acquitted so that the Furies can be appeased and transformed into Eumenides. The Areopagus court is also established in this play, often considered to be a foundational play of Athenian Democracy. Orestes is at the oracle of Delphi, pursued by the Furies. He is a suppliant at the temple of Apollo, asking for the god’s protection. Following Apollo’s advice, he comes to Athens, where he becomes a suppliant at the statue of Athena. The raging Furies follow in hot pursuit, urged on by Clytemnestra’s ghost. A solution will be reached at Areopagus, the court of Athens. Orestes and the Chorus of the Furies will, each in turn, vindicate their beliefs. Athena’s tie-breaking vote acquits Orestes, who sings the praises of Athens and declares that from this point onwards an unbreakable bond has been forged between Athens and his homeland. As per Athena’s declarations, the Furies are transformed into benevolent divinities, the Eumenides. The trilogy comes to a close with the balance being redressed, on a note of reconciliation. Shortly afterwards, in 462 BC, due to democratic reforms, homicidal crimes will start falling under the jurisdiction of Areopagus. The final and most difficult cleansing is attempted here. A chorus of ten actors will try to carry it through, setting up a trial for everybody: dead, living, men, women, mortals, gods - a deeply political action. Two national theatres, the National Theatre of Greece and Cyprus Theatre Organisation, join forces to produce an iconic play: a tragedy about war and the dead, existential dread, dignity, faith and resilience, in a new translation by Giorgos Koropoulis. It has been 43 years since the tragedy was last staged by the National Theatre of Greece – the only time in the National Theatre’s history – directed by Takis Mouzenidis, and 29 years since the first presentation of the play by the Cyprus Theatre Organisation in Epidaurus, directed by Nikos Charalambous. This new production, a joint venture of Greek and Greek Cypriot artists, is brought to life by the incumbent artistic director of the National Theatre of Greece, Stathis Livathinos. The mothers of the Argive generals who perished in Thebes fighting by Polynices’ side become suppliants at the temple of Demeter in Eleusis, joined by Adrastus, king of Argos. The suppliants plead with Theseus, king of Athens, to help them: the Thebans are keeping their dead sons as spoils of war and will not allow them to be buried. In response to this just plea, Theseus decides to send out a message to Creon, king of Thebes. Soon, a Theban messenger arrives bringing a message to Theseus: he is to drive Adrastus and the mothers away, otherwise the Theban army will attack the Athenians. Theseus leads the Athenian army against Thebes and ultimately retrieves the corpses and has them carried to Eleusis, where they are to be burnt properly. A delirious Evadne, widow of Capaneus, jumps into the funeral pyre to burn along with her husband. Mothers and children return home, carrying the ashes of their beloved ones with them. Written in 422 BC, the tragedy echoes the battle of Delium (424 BC), in which the Thebans, allies of Sparta, defeated the Athenians and for several days would not allow them to retrieve their dead and bury them properly. Sophocles’ masterpiece and arguably the ancient Greek tragedy par excellence begins with a mystery. The city of Thebes is afflicted with plague. King Oedipus wants to know why this is the case. The oracle is clear: Apollo demands that Laios’ murderer be punished in order for the city to be cleansed. The king decides to solve the mystery, thus setting in motion a series of horrific revelations. I have confronted Oedipus on stage twice: the first time was when I depicted the character in a Spyros Evangelatos production. On the second occasion, I portrayed three characters, Jocasta, Tiresias, and the Shepherd in a performance directed by Cezaris Graužinis. There are two aspects in this play, arguably the absolute masterpiece of ancient Greek drama – at least among the extant plays – that act in a complementary manner. The first thing to note is its flawless plot. It is the first play in the world canon that can be classified as suspense/thriller (or whodunit, as the British would have it). Unravelling the plot, the hero masterfully reaches the centre of the maze, the point where the pursuer and the pursued are proven to be one and the same. Even if we sometimes overlook this detective aspect of the play, perhaps rightfully seeking other qualities in it, I can’t help but remember the audience gasping in unison at hearing the phrase: “Polybus was not your father” – an audience response which gave me chills. The second aspect, the one making Oedipus the first existentialist play in the world canon, is the question it raises: “Who am I?” The tools employed by the character to answer this question are the same tools that humans – especially Western humans – have idolized: reason, thought, logic. They are the only tools in our possession, the instruments that have taken our species to the very top, yet they do not suffice. If one decides to raise this particular question, one must also be prepared for the answer that comes with it. As the poet Odysseus Elytis once wrote: “Truth is given only in exchange for death.” Oedipus is the first Man, the Adam of ancient drama. And his fate cannot but humble us. One of Euripides’ late plays, it was written between 408 and 406 BC and presented posthumously at the Great Dionysia, where it won first prize. The tragedy focuses on the fateful decision of Agamemnon, commander of the Greek forces, to sacrifice his daughter, Iphigenia. In the beginning of the play, the Greek fleet plans to sail to Troy, but remains stuck in Aulis as the wind has lulled. The seer Calchas reveals that the wind has died down due to Artemis being furious with Agamemnon after being insulted by him. The goddess will only be appeased if Agamemnon sacrifices his daughter, Iphigenia. Agamemnon invites Iphigenia to Aulis, on the pretext of marrying her to Achilles, the most admired warrior among the Greeks, prior to their departure for the war. Faced with a horrific dilemma, torn between his daughter and his people, Agamemnon nevertheless decides to proceed to the sacrifice, dismissing the pleas of Clytemnestra, Iphigenia, Achilles, the army threatening him with mutiny, even his own brother, Menelaus. The noble Iphigenia ultimately reconciles herself with her tragic fate and her heroic death for her people’s sake. In the denouement, a messenger announces to Clytemnestra that Iphigenia’s body disappeared from the sacrificial altar shortly before receiving the final blow. Written near the end of his life, Euripides’ play is full of twists and dilemmas, replete with irony and startling moments of comedy; an oft-performed text that even nowadays raises a number of questions on literature, drama and theatre. Similar to the other plays tackling the Atreides family, the characters in Iphigenia in Aulis are burdened with an ancestral curse. We know from the first that things are not likely to turn out very well. Imbued with the atmosphere of its time, with the Athenian democracy on the brink of collapse and the imminent defeat at the Peloponnesian War looming large, the tragedy conveys a crumbling world where faith to heroics and patriotic values has been shaken; a world in which the mob takes matters into their own hands, whereas the weak, petty, cowardly, unstable and temperamental heroes begin to disintegrate. The pursuit of power remains the only constant, each time assuming a different form. The tension between the public and the private, the male and the female, the polis and the family generates characters who will not hesitate to cross the line. This subversive tale of twists and turns is neither one of romantic self-sacrifice nor is it one of patriotic drama; rather, it addresses a constant struggle and an upset of balance. In Aulis, it is not just the wind that has abated; life itself has died down. Everybody is eagerly waiting for something to happen. Very soon, something will indeed ensue: the abolition of logic. masters of theatre, this time on an ancient Greek tragedy, was the perfect opportunity for Éric Ruf, general administrator of Comédie-Française, and Vangelis Theodoropoulos, artistic director of Athens & Epidaurus Festival, to bring together these two great institutions of European theatre in a collaborative project. 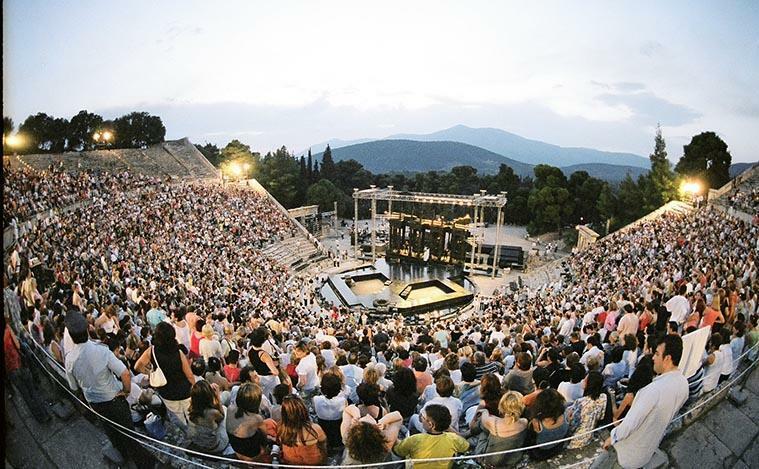 This performance marks the first time ever that the oldest active theatre company in the world will perform at the Ancient Theatre of Epidaurus. Ivo van Hove, who opened Athens Festival 2018 with his extremely successful stage adaptation of Bergman’s Persona / After the Rehearsal has clarified that all of his collaborations are born out of his love at first sight with a particular text. In this case, the director brings together two Euripides plays telling the story of Electra and Orestes and more specifically how the two siblings reunite and make a pact to take revenge against their mother, Clytemnestra, and her lover, Aegisthus. This performance also marks the first time that Euripides’ Electra will be performed by Comédie- Française. Orestes was last presented by the company at Salle Richelieu back in 1923. Widely acclaimed for his formidable talent and his ability to dramatize texts, the director of Toneelgroep Amsterdam constantly redefines his aesthetics and his relationship with the actors. Even though Van Hove denounces the concept of the ‘method,’ he revisits the ancient drama, paying tribute to its social dimension and illuminating the myth with a very clear sense of its relevance to our times. The story in Ivo van Hove’s words Electra and Orestes are brother and sister. Young, hurt, fragile and vulnerable, they turn into savage beasts. They have never really known their father, who left when they were little to serve as the commander of the Greek army during the Trojan War. They think of their mother, Clytemnestra, as the enemy, and of their family home as the battleground. Agamemnon’s absence has elevated him into a hero in their eyes. Driven away from their home, the former royal offspring, Electra and Orestes, have become refugees inside their own family and their own country. Excerpts from Ivo van Hove’s interview. The family is the Gordian knot of society, and, as such, creates a number of problems. We are standing in front of a mirror reflecting the negative image of our own impulses. Is this an incestuous family? Not in the literal sense (or at least, not just in the literal sense) of the word, but in the sense of family as a battlefield on the one hand, a place where problems are resolved, and on the other hand, a place to separate the wheat from the chaff, those who have been chosen to stay from those who will be permanently banished. In our performance of Electra / Orestes, we want to enact a world of great cruelty, a naturalistic world even, on stage. Truth be told, I conceived this performance as a Gesamtkunstwerk, a total work of art in the Wagnerian sense of the term, in the sense that we are perhaps taking part in a ritual. I consider myself Belgian as much as I consider myself European and citizen of the world. Talking about society means talking about the world at large. The Greeks pose a crucial question: what is that element which unites us instead of dividing us? This is the central question in Electra / Orestes. I hold my collaboration with the actors of Comédie-Française in high esteem. I felt they have a burning desire to perform theatre; a visceral need to embrace an artistic adventure. Admittedly, Comédie-Française and Toneelgroep Amsterdam are my two best experiences as a director. When Éric Ruf proposed yet another collaboration, I accepted his proposal at once. Founded in 1680 by Molière’s company of actors, Comédie-Française is one of the most famous and oldest active theatres in the world. Spanning three centuries of rich history, the permanent company breathes life into a classical and modern repertoire, both French and international, cutting across 3,000 works by over 800 writers. With a staff of 400 making sure that the curtain rises every night on the central stage of Palais Royal in the heart of Paris, Comédie-Française is the only theatrical venue in France today still using the practice of rotating repertory. With two more performance halls in Paris, Théâtre du Vieux-Colombier and Studio-Théâtre, the company tours regularly in France and around the world. The motto of the company, simul and singulis (together and individually) conveys its power and longevity: the collective nourishes the individual, who in turn enriches the collective. The beehive, as emblem of Comédie-Française, denotes a multifaceted, constantly renewed creative force, highlighting the House of Molière as a school of arts and language, a home for artistic growth and creativity. Aristophanes’ masterful comedy was first presented at the Great Dionysia in 423 BC and attacks Socrates’ teachings and the philosophical ideas of the time. The elderly, largely uneducated Athenian Strepsiades, is in debt owing to the extravagant lifestyle of his profligate, pampered son, Pheidippides. Strepsiades tries to convince him to enrol in Socrates’ Phrontisterion (Thinking Place), where he will be taught the difference between right and wrong reason and will learn to defend himself in court against his creditors. When Pheidippides refuses to comply, Strepsiades enrols himself, despite his advanced age. There, impressed by the wealth of ideas he comes across he asks to meet the master himself. Socrates appears and the induction ceremony of the elderly student begins. However, Strepsiades proves to be an inept student. Ultimately, Pheidippides succumbs to his father’s threats and is forced to enrol in the school. Father and son watch as the Superior (Right) and Inferior (Wrong) Reason clash, each arguing they can offer the best education to Pheidippides. The Wrong Reason emerges victorious. Strepsiades later returns to pick up his son, now transformed into a paragon of intellect. Strepsiades makes a feast at his house to celebrate his son’s transformation and even drives away two creditors who show up asking Pheidippides to appear in court. When Pheidippides threatens to beat his father, using the arguments he has been taught, a raging Strepsiades decides to destroy Socrates’ school. In The Clouds, Aristophanes suggests we dispense with rationalism and sets us on a direct collision course with the poverty of ideas. Central in this tragicomedy is an Everyman, Strepsiades, coming in contact with Socrates and through him with the great immaterial ideas, the Clouds. Through his Chorus of Clouds, the Messiah-like Socrates initiates Strepsiades into a new kind of faith and a novel way of viewing the world as a godless place, an intellectual utopia. When Socrates’ theory and the integrity of his teachings crumble, Strepsiades feels betrayed and resolves to destroy Socrates’ school in what is one of the most enigmatic and tragic finales in Aristophanes’ oeuvre. Both arguments represented in the play are undermined in the face of a despairing void. Remaining faithful to Aristophanes’ biting comedy, scathing empty knowledge and the clientelism prevalent in mentor-student relationships, the performance casts the Clouds as the protagonists, bringing into question the omnipotence of reason and heralding the return to a longlost spirituality. It could very well be the most ancient tragedy. Or the most enlightened text of all time. Or the most cryptic text in the world. Or the profanest text ever written. Or the most sympathetic text about this writhing creature, caught between the profuse light of the universe and the deepest darkness which others try to impose on him. Gods, great and small ones alike; prejudices and fears. Man, the greatest of torture victims, now and forever. A sacred text or a liberating manifesto? Elevated by rage or wisdom? Do its words betray mourning or vengeance? Do the dramatis personae communicate resignation or perseverance? Prometheus is not one of those conventional stories found in epic cycles. The pace is breathless, comes in fits and starts, elliptical, even in long monologues; not unlike a delirium, a nightmare or a dream of the future. One keeps wondering whether life is a punishment, the result of the original sin, or rather a choice for man himself to define his fate on Earth on his own terms. A contemporary Prometheus performance can no longer serve as allegory or parable. It cannot be built on symbolism or give way to an exoticization, as it usually happens when we rely on our imagination to visualize the beginnings of the world. Today, we can only be moved by a Prometheus banished in the wilderness of a modern metropolis, a scapegoat of contemporary societies anticipating and seeking his redemption. If the minor characters of Bia and Cratus, the servants of the invisible Zeus, assume the form of Fear that takes root around us and inside us, then the agony to live is transformed into meaningful action and Prometheus emerges as a ‘useful’ hero. The fire stolen by Prometheus is the everburning light.